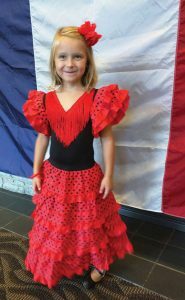 Sofia represents Spanish culture by wearing a traditional Spanish flamenco dress. Montgomery’s Sister Cities Commission will host “Dinner Around the World” for residents and non-residents alike. “The event offers the Montgomery community the opportunity to create new friendships, experience food from other cultures and learn about their neighbors,” said Marcallene Shockey, Sister Cities Commission chair. Participants should take a favorite cultural dish, appetizer or dessert to share at the international buffet table. Non-alcoholic beverages will be provided. A free cooking demonstration will be provided by Simply French. Guests are invited to share some aspect of their ethnic culture through song, dance or traditional dress. They should indicate this desire when making reservations, which are due by Wednesday, Feb. 7.